The Ozama Fortress (Spanish: Fortaleza Ozama) was built in 1502 by the Spanish at the entrance to Santo Domingo's Ciudad Colonial, Dominican Republic, and overlooking the Ozama River. Named after this river, the castle, also referred to as "La Fortaleza" or "The Fortress", is the oldest formal military construction of European origin in the Americas. It was declared by UNESCO as a World Heritage Site, together with the other historical monuments of the Ciudad Colonial. An impressive architectural structure of medieval style and design, the Tower of Homage (Spanish: Torre del Homenaje) stands in the center of the grounds. The castle was designed to guard the entrance to the port of Santo Domingo and defend the city from seaborne enemies. Construction began in 1502 and it was completed in 1505. The entrance gate on Calle Damas was originally built in 1608, known as the Prevention Gate. The castle was well-built enough to serve as a prison until the 1960s. When the prison was closed, the "Fortaleza" was opened to the public. It is located at the end of Las Damas Street. Wikimedia Commons has media related to Fortaleza Ozama. ^ Harvey, Sean; Fullman, Joe (1 January 2009). The Rough Guide to the Dominican Republic. Rough Guides. p. 76. ISBN 978-1-85828-811-6. Retrieved 4 June 2012. ^ a b c Tuider, Katherine; Caplan, Evan (4 January 2012). 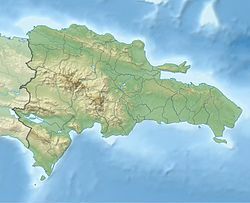 Dominican Republic (Other Places Travel Guide). Other Places Publishing. p. 97. ISBN 978-1-935850-09-0. Retrieved 4 June 2012. This castle-related article is a stub. You can help Wikipedia by expanding it. This page was last edited on 23 February 2019, at 04:08 (UTC).